﻿ Mosquito Control for Horses and Livestock in Fairhope, Daphne, Gulf Shores and Orange Beach. Mosquitos can pass dangerous—and potentially fatal—illnesses to livestock and horses through just one bite. From West Nile virus to several strains of encephalitis, mosquito-borne diseases can cause serious consequences for your animals. The best way to protect your livestock and horses is through prevention. Eliminating mosquito populations can lower your animals’ chances of being bitten, which drastically reduces their risk of infection. 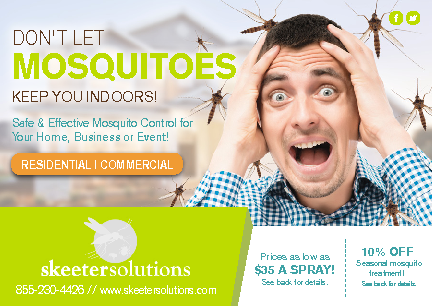 Skeeter Solutions uses an ecologically friendly, animal-friendly insecticide that kills both larvae and adult mosquitos. Our technicians will come to your location and conduct a thorough evaluation of your barn or stable. We’ll find mosquito breeding grounds and create a strategic plan to exterminate them quickly and efficiently. Keeping your animals safe from mosquito-borne illness and disease is as simple as calling Skeeter Solutions. We can spray your entire barn or horse stable, pastures and feeding areas with our non-toxic insecticides, which start working immediately. These insecticides kill mosquitos and repel others from coming into the sprayed area, so your livestock and horses will be safe for several weeks after the application. Skeeter Solutions can design and implement a mosquito spraying system in your stable, barn or other animal shelter that will keep them safe throughout mosquito season. Our systems require very little maintenance and can be designed to work in almost any space. 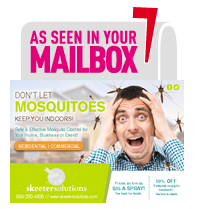 Call Skeeter Solutions to find out how we can help you protect your animals from mosquito-borne diseases. A mosquito barrier spray or custom mosquito spraying system will protect you and your workers when you’re in your animals’ shelter as well. Our friendly, knowledgeable staff is available at (251) 279-0345. We’ll answer any questions you have about mosquito barrier sprays or spraying systems and schedule an appointment that works for you.